C. cephalantha and C. angustior of Michigan Flora. Bogs, tamarack swamps, shores, marshy or swampy ground, and meadows; in acidic, peaty or sandy soils. 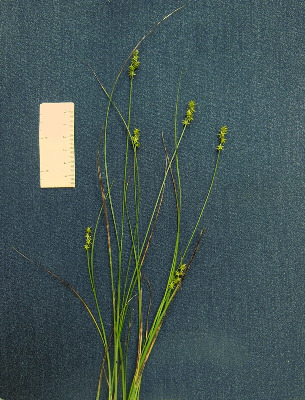 In northern Michigan especially, plants of sandy, low nutrient sites may have very narrow, small perigynia, often in dense heads. These may be called var. angustata (J. Carey) L. H. Bailey (C. angustior), but appear to grade into larger plants without any discontinuity. MICHIGAN FLORA ONLINE. A. A. Reznicek, E. G. Voss, & B. S. Walters. February 2011. University of Michigan. Web. April 20, 2019. https://michiganflora.net/species.aspx?id=955.